A MAN ACCUSED of killing three people in a shooting at a Planned Parenthood clinic has said that he’s a “warrior for the babies”. Robert Lewis Dear (57) made the comments yesterday during a court hearing for prosecutors to announce the charges filed against him. He also said he was guilty and that there will be no trial. Dear is accused of killing three people at the Planned Parenthood Colorado Springs Westside Health Centre in Colorado on 27 November. Two civilians and a campus officer were killed in the shootings and nine others were injured during a five-hour standoff. “You’ll never know what I saw in that clinic. Atrocities. The babies. That’s what they want to seal,” Dear said during the hearing. He also frequently interrupted his publicly appointed defence attorney – Daniel King – throughout the course of the hearing yesterday, objecting to the lawyer’s attempts to limit the publicity of the trial. King was also the attorney for Colorado shooter James Holmes, who killed 12 people and wounded 70 in 2012 at a midnight premiere of the Batman movie, The Dark Knight Rises. Holmes was on anti-psychotic medication throughout his trial this year following the shootings. He was sentenced to life in prison. King did not address Dear’s outbursts, but raised doubts about whether he was competent to stand trial, saying defence attorneys wanted investigators to turn over evidence as soon as possible so they could assess the “depth of his mental illness”. While Colorado Springs police refused to disclose a motive for the crime, there was mounting evidence that Dear was deeply concerned about abortion. One source that spoke to AP on the condition of anonymity said that Dear asked at least one person in a nearby shopping centre for directions to the clinic before opening fire. Killed in the attack were Garrett Swasey (44), a University of Colorado-Colorado Springs officer who rushed to the scene; Ke’Arre Stewart (29) an Iraq war veteran who was accompanying someone at the clinic; and Jennifer Markovsky (35) who also accompanied a friend at the clinic. Five other officers who arrived at the scene were also shot and injured, with police saying that Dear eventually turned himself in. “Could you add the babies that were supposed to be aborted that day? Could you add that to the list?” Dear said at one point during the hearing as Judge Gilbert A Martinez discussed the pretrial publicity order. He also accused his attorneys of being in “cahoots” with Planned Parenthood to “shut me up”. “I want the truth to come out. There’s a lot more to this than for me to go silently to the grave,” he said. Dear has lived in remote locations without electricity or running water and is known to hold survivalist ideas. One of his three ex-wives, Barbara Mescher Micheau of Moncks Corner, South Carolina, said that he vandalised a South Carolina abortion clinic at least 20 years earlier, announcing to her that he had put glue in the locks of its doors. Judge Martinez set the next hearing for Dear for 23 December. A first-degree murder conviction in Colorado can lead to life in prison or the death penalty. 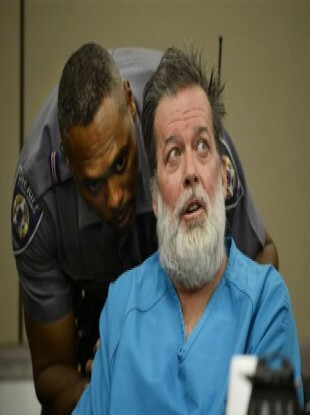 Email “Man accused of killing 3 in Planned Parenthood shooting says he's a 'warrior for the babies'”. Feedback on “Man accused of killing 3 in Planned Parenthood shooting says he's a 'warrior for the babies'”.